Just two home games remain this season meaning we are officially down to the nitty gritty. The Rams will look at extend their winning streak to nine games this Wednesday in a game with so much on the line. Here’s a look at exactly what Wednesday’s game means for VCU as well as some other Tuesday VCU news nuggets. Wednesday’s game is a huge one for a few reasons. For starters, a NCAA tournament hopeful simply cannot lose to SLU team that will likely finish its seasons outside of the RPI top-250. That’s what we and the tournament selection committee would define as a “bad loss”. It would be a killer. A win on the other hand would 1) keep VCU atop the A-10 standings with Dayton (assuming Dayton doesn’t lose to George Mason tonight) in the race for a regular season title and 2) wrap up a double-bye in this year’s Atlantic 10 tournament. What is a double-bye you ask? Well, it means VCU would be among the A-10 top-4 teams who get to watch four teams play on Wednesday night in Pittsburgh and then eight teams the following evening. It would mean a three-game path to an A-10 tournament championship instead of a brutal four-game rout. VCU has advanced to the conference tournament final all four seasons since joining the Atlantic 10, oddly enough only winning it the one time they did finish outside of the top-4. But note, during VCU’s CAA years, no CAA team had won four games to win that tournament. Even though VCU has done that once in their new conference home, it’s simply not something you want to make a habit of attempting. Hard to believe this is Lewis’ first such award this season but it’s true. The senior guard averaged 25 points and five assists in VCU’s two wins this week, earning hime share of the Player of the Week honors with Davidson’s Jack Gibbs who averaged 26.5 points and 4.5 assists. 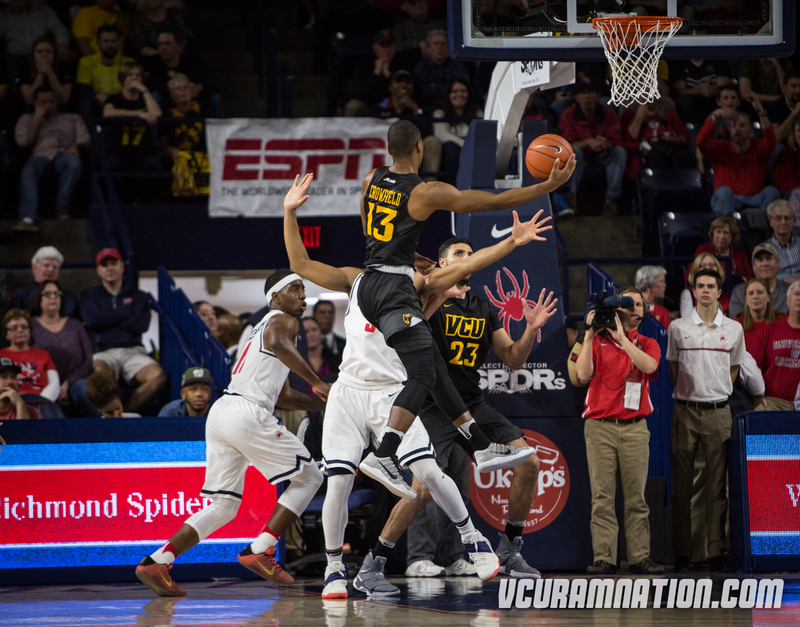 The two met last week in Richmond in a 74-60 VCU win, both scoring 27 points on the evening. Lewis has posted a career-best 113.4 offensive rating this season, hitting over 41% of his threes for the second consecutive season. Keep an eye on Malik Crowfield from here on out. The freshman hit three of his five threes in VCU’s road win at Richmond, bringing his season/career three-point shooting percentage up to a respectable 37.9%. That might not scream “future legend”, but take at how it compares to the freshmen season’s of previous VCU sharpshooters in their rookie campaigns. Fellow freshman De’Riante Jenkins would actually lead that group in terms of percentage at 44.4% but has only taken 27 threes due to a broken foot that has sidelined him the past 13 games. Maine transfer, Issac Vann, who’s currently redshirting the season due to NCAA transfer rules, hit 41.2% of his 51 threes with the Black Bears a season ago. All three will be active next season in a sophomore class that combined with Samir Doughty could be one of the more talented offensive classes we’ve seen at VCU.